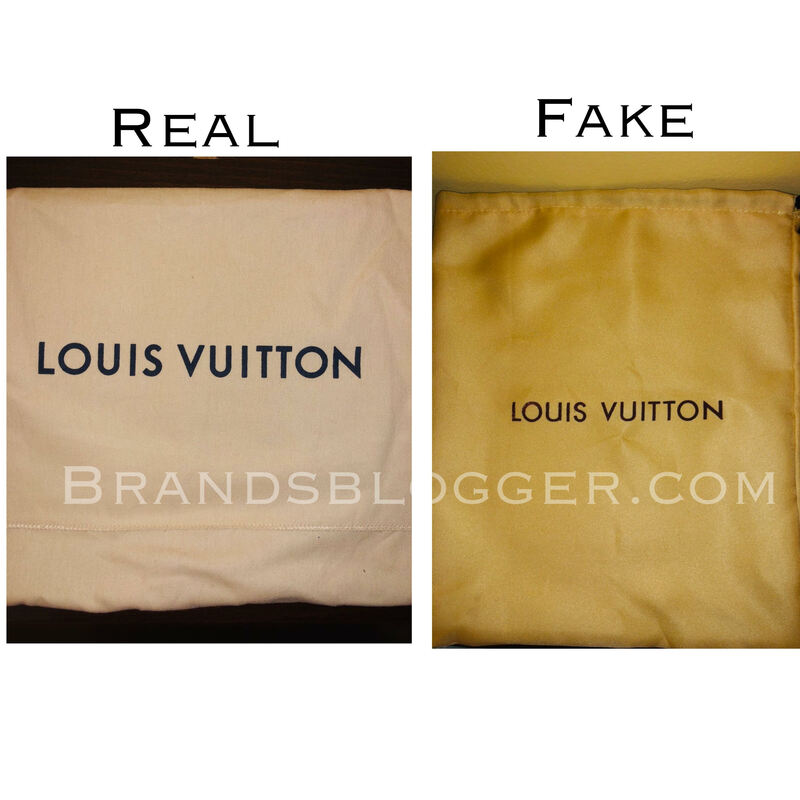 THE FIRST BAG IS THE FAKE ONE. 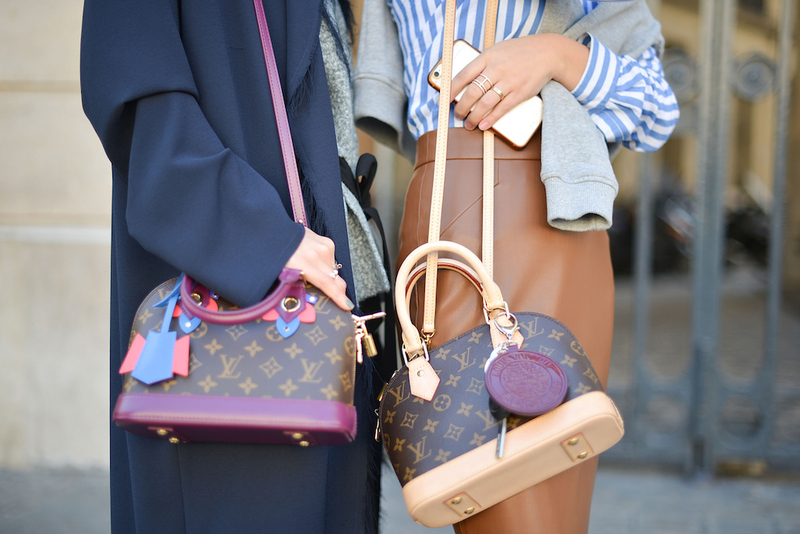 When we need something sporty and classy at the same time, we can count on LV Alma bag. It is waterproof and fireproof. Personally, I have the Damier ebéne canvas BB. I love it even I can not take a lot of things with me, but it’s perfect for essentials. Even Alma couldn’t avoid the replicas and for this model its very difficult to spot if it’s a replica. 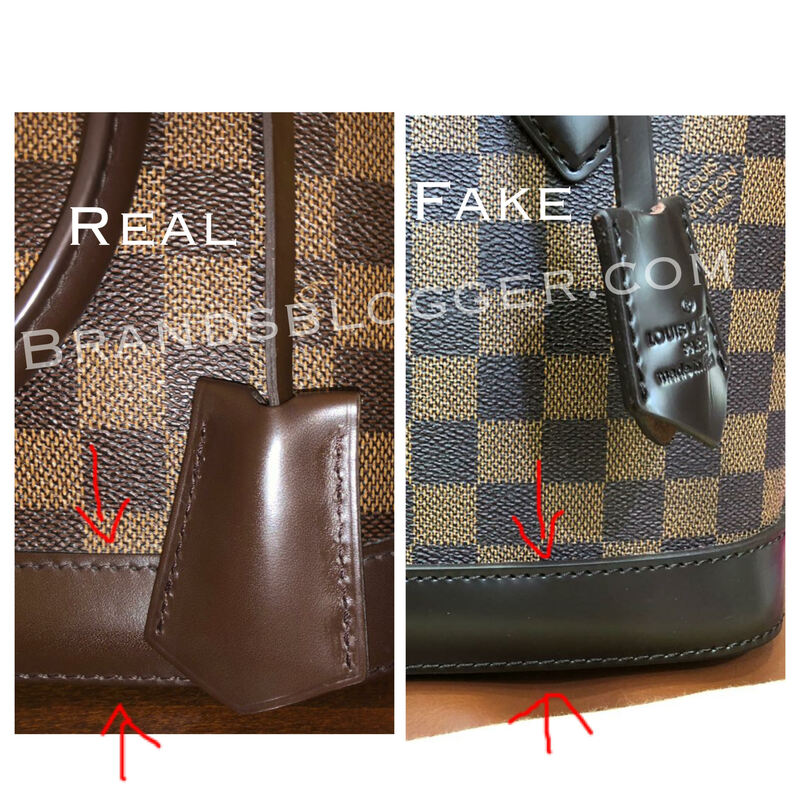 Today I’ll help you to easily recognize a fake LV Alma bag and the authentic one. 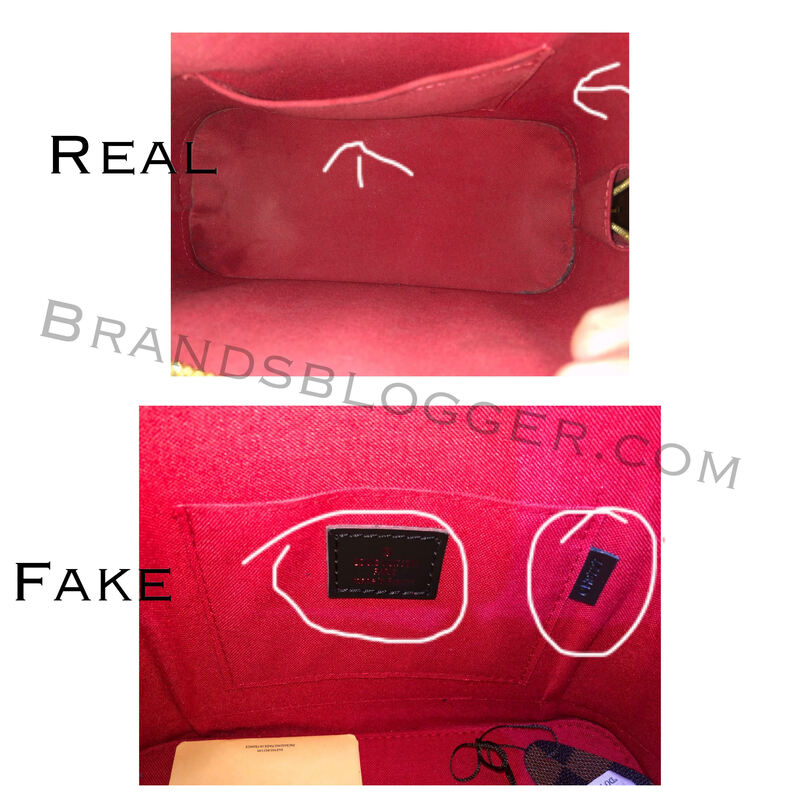 Be careful and focus on the original, so if you face any kind of replica it will not be a problem anymore to spot it. No one can fraud you. But not all the bags are the same, they may have small differences because not all the bags are of the same date and made in the same place. If you take a look at the picture you can notice the writting and the color of the box. 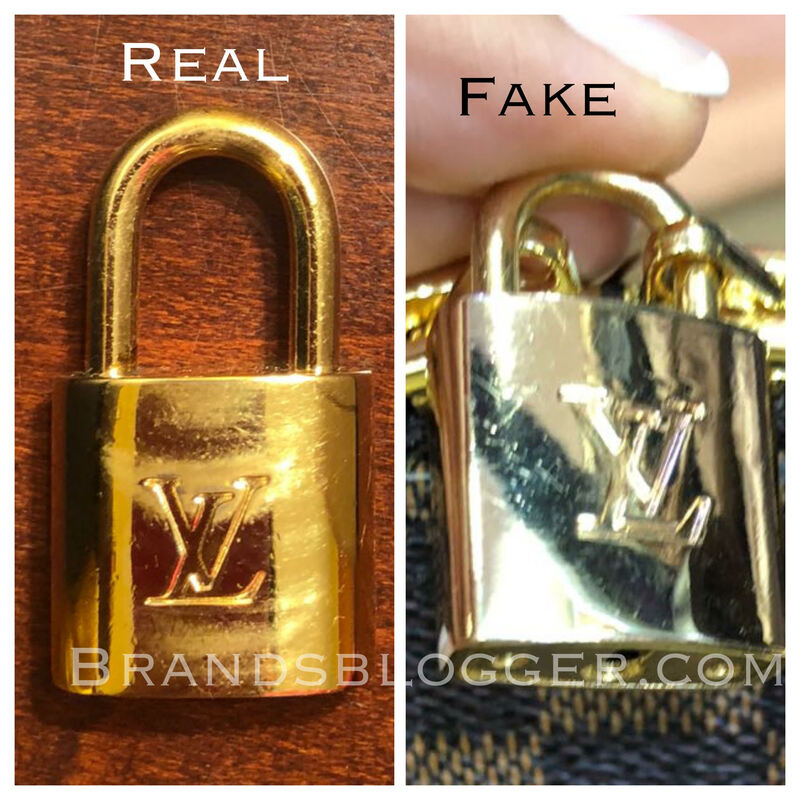 Beside the gold color of the padlock that in the original is shiny and beautiful and if you pay attention at the trandmark you will see the differences in the letters LV. 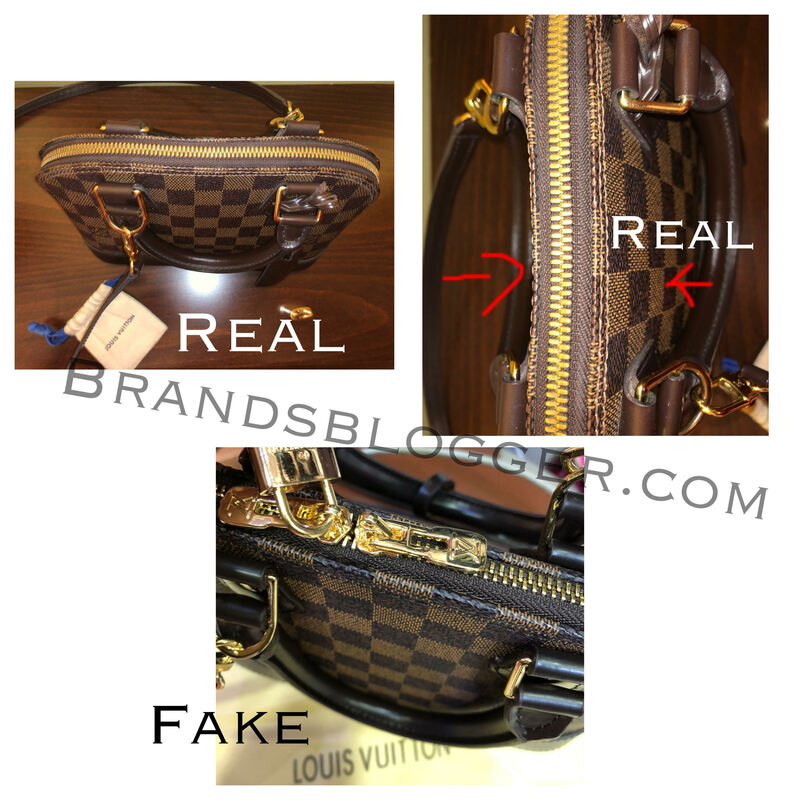 On the other side you can see that the writting in the original is only Louis Vuitton Paris, meanwhile in the fake bag it is Louis Vuitton Paris made in France. Be carefull to see the size, the shape, the color and the letters so that you can spot the differences. Inside the bag, there is a small pocket that Is completely different from the replica. 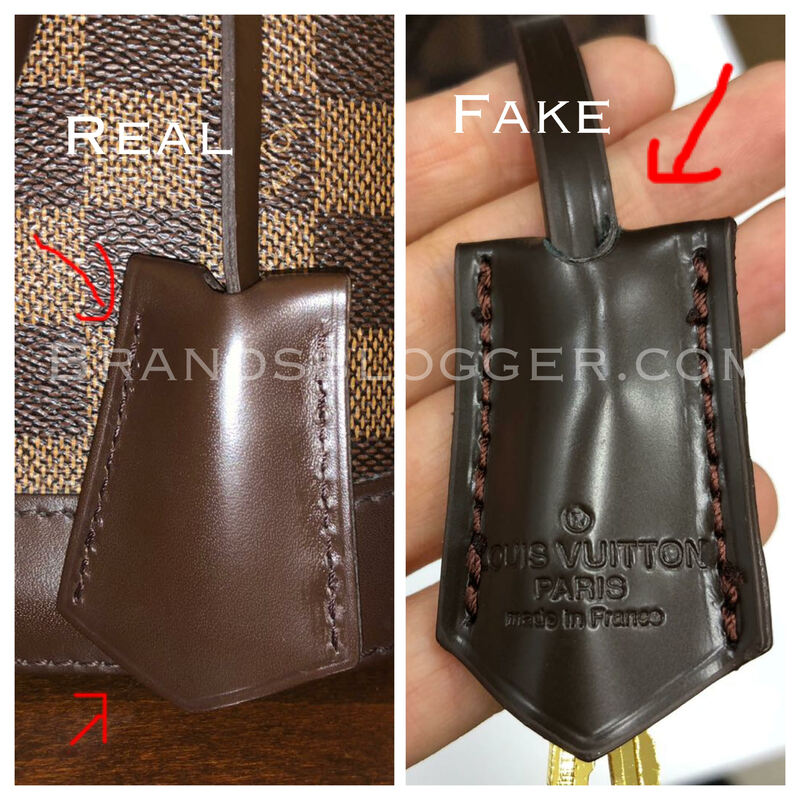 In the original, there is no stamp leather as it is in the fake one. The Pocket is very simple and the color is specific, you can tell the difference by the photos below. 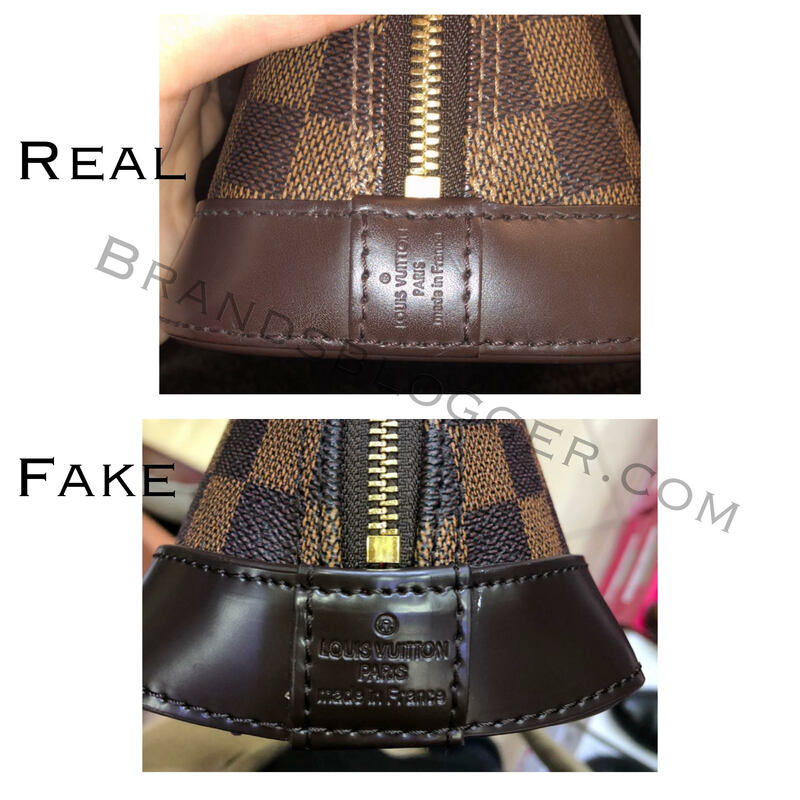 The stitches in the authentic bag are very regular and elegant. 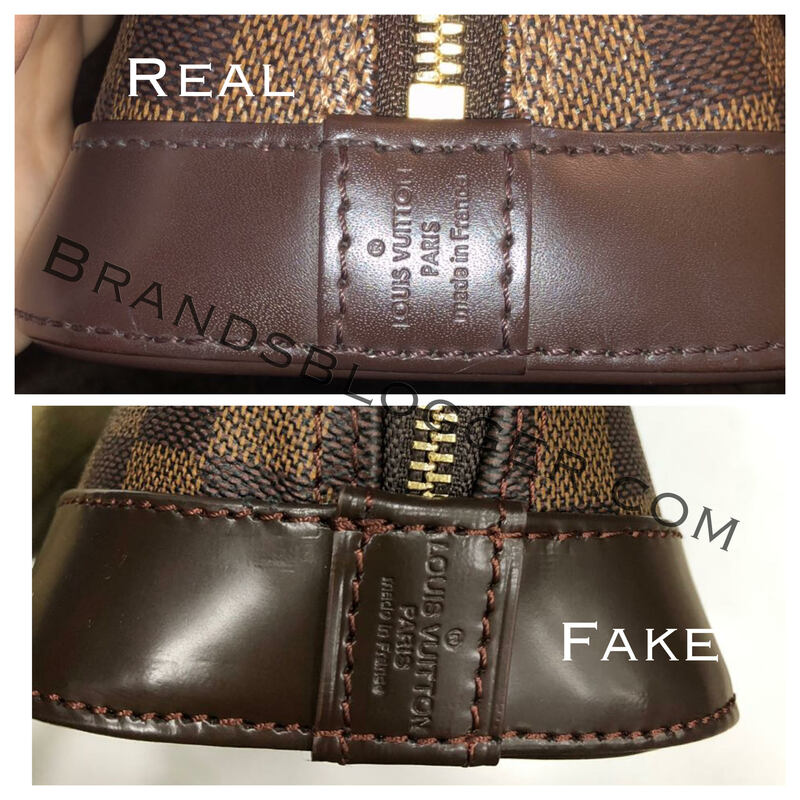 In every point that we will discuss below, we will see the stitches in a closer look everywhere around the bag, so be patient and careful. 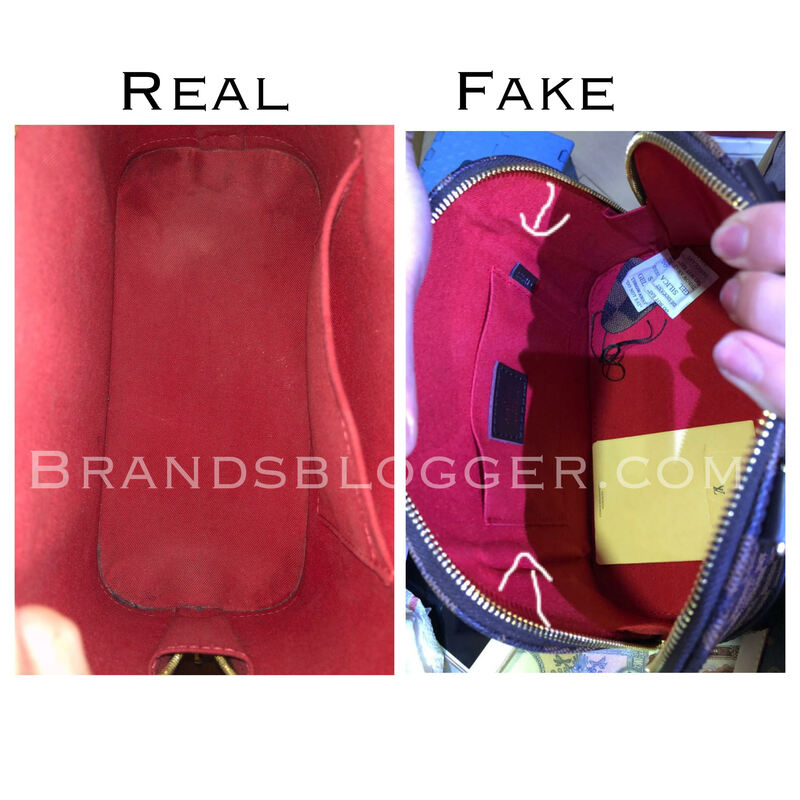 The code in the authentic bag is difficult to watch and it is located inside the bag, but as we saw before at the inside of the bag, in the fake one the code is located outside the pocket and badly written. The clochette of the authentic has perfect stitches, regular, symmetric and they have 6-7 stitches. In the fake bag it’s obvious the cheap stitches. The difference starts with the shape and color as you can see at the picture. You have to look at the writing on the clochette, it’s very interesting. In the original, one side is clear and has no writing in it, in the other side you can clearly see the initials (if you have printed them) and the country where it is made from. 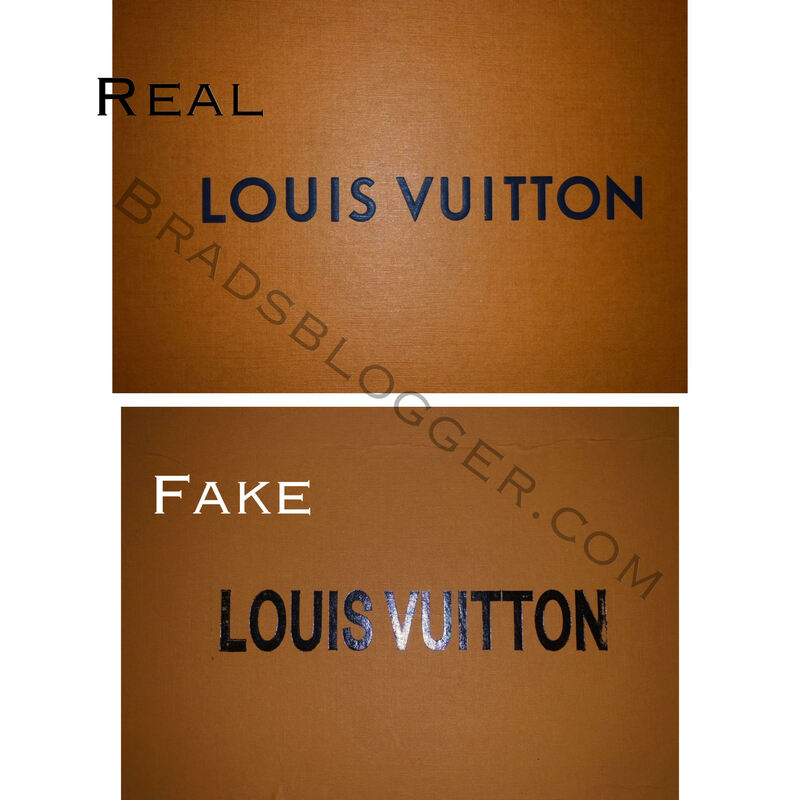 For example, in the real one it’s written only Louis Vuitton Paris, meanwhile in the fake one it’s written Louis Vuitton Paris Made in France. So read this carefully because it’s very important. 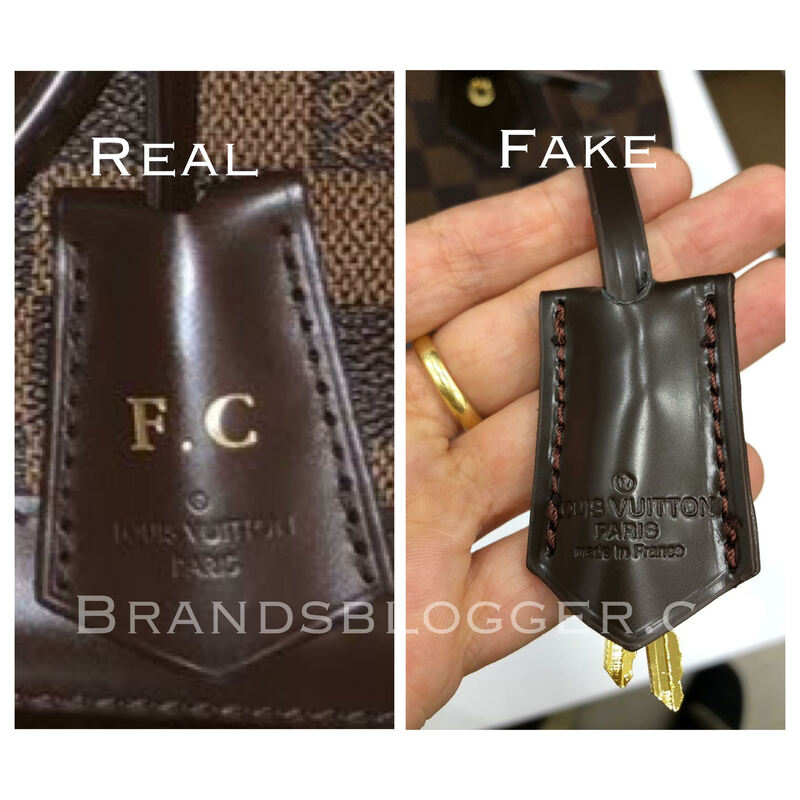 The key of original Alma LV Bag has a number stamped on it, so in case you lose it, they will replace it with another one with the same code you had. 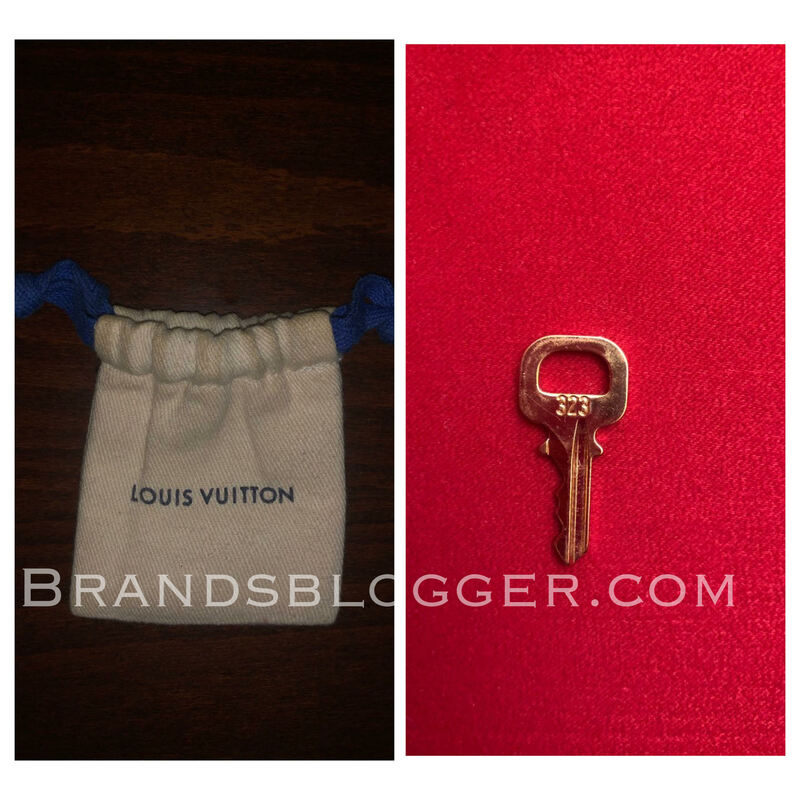 The keys and padlock comes with a dust bag. I’ll demonstrate it in the picture below. The zipper is a very important part of this bag. In the authentic bag the zipper is a quintessential component, looks solid, straight and it had a beautiful color of pure gold. 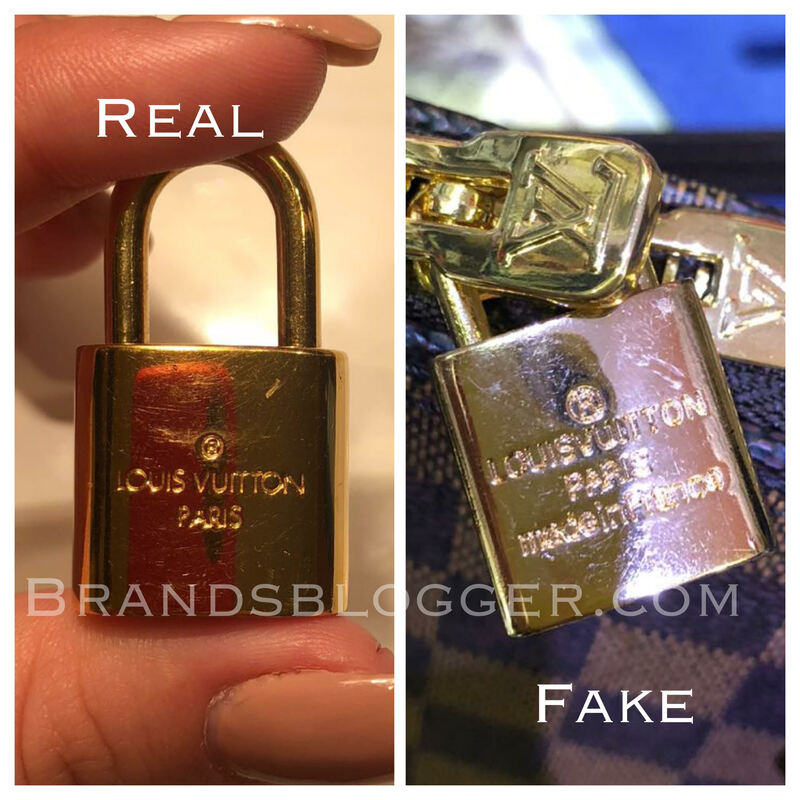 It is smooth to open and I think everyone can notice the difference between the fake and the real one. Let’s take a look below. 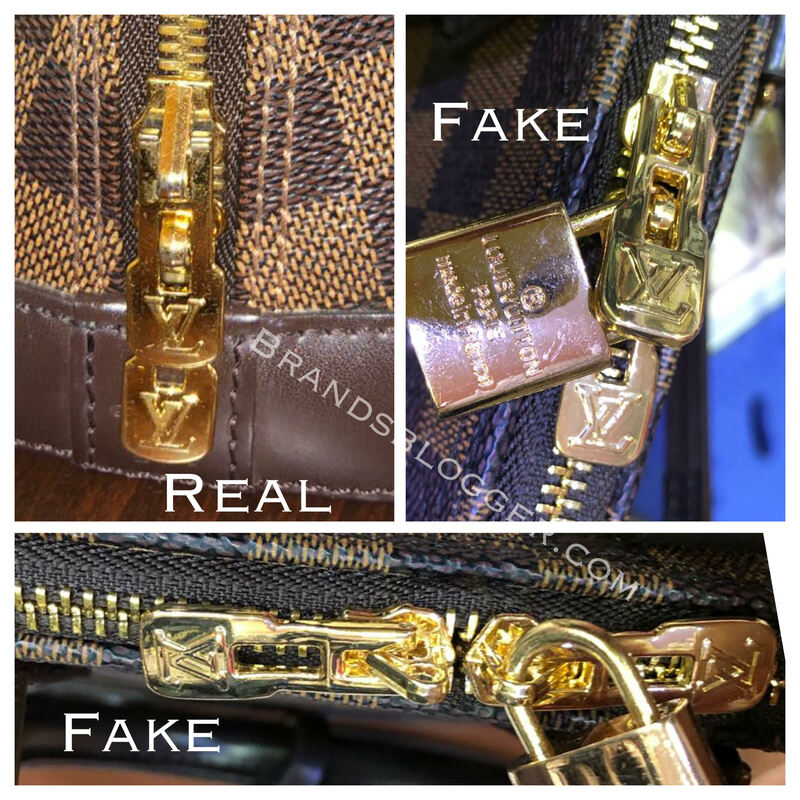 The slider of the zipper is different from the fake one, look at the letters LV. Like I said before it’s not the same trademark. The handle prolongs the lifespam of the bag, for this reason, they are very important. 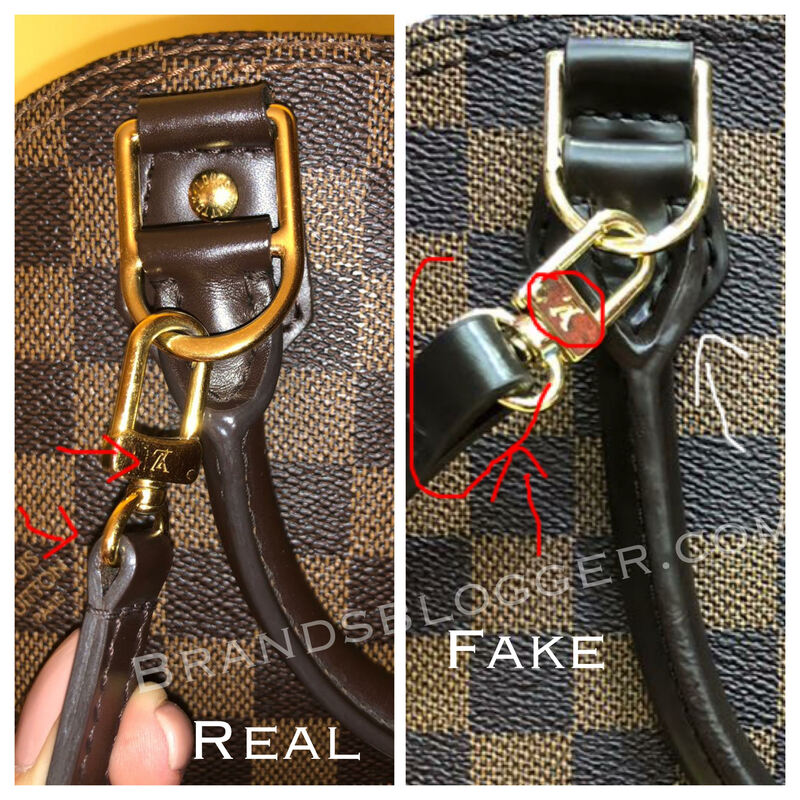 In the authentic bag, the handles are very strong, have a beautiful gold color and in a particular shape, can’t tell the same things for the fake one. Take a look at the photo. Focus at the color and the shape. Look at how flat the original is. 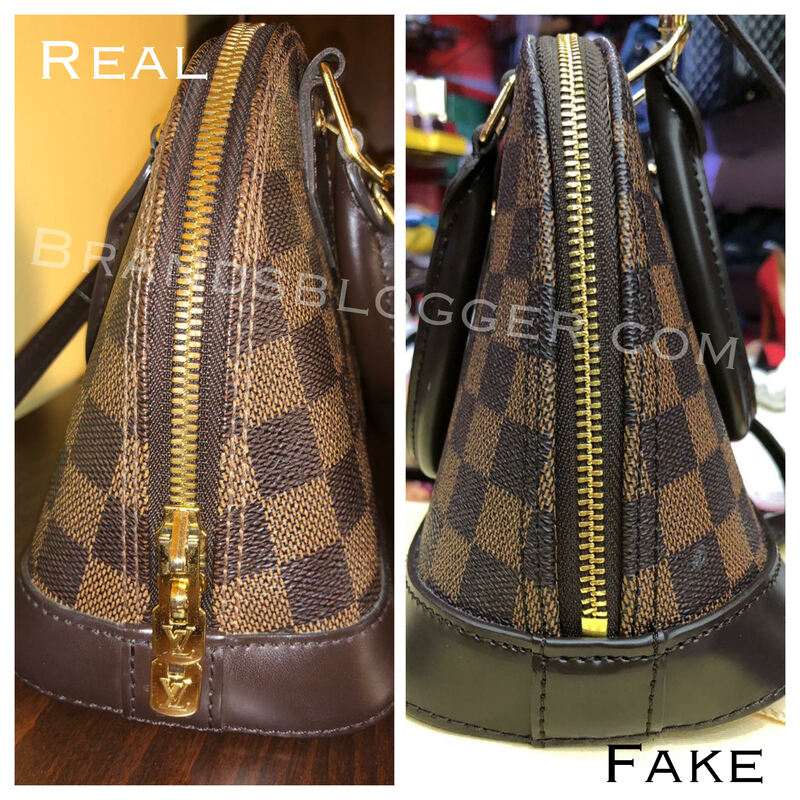 So, every time you will see an Alma bag if the elements of the bag are not as the real as the one I’m showing you, the bag is probably fake. I’m showing you two pictures to spot the differences between them. 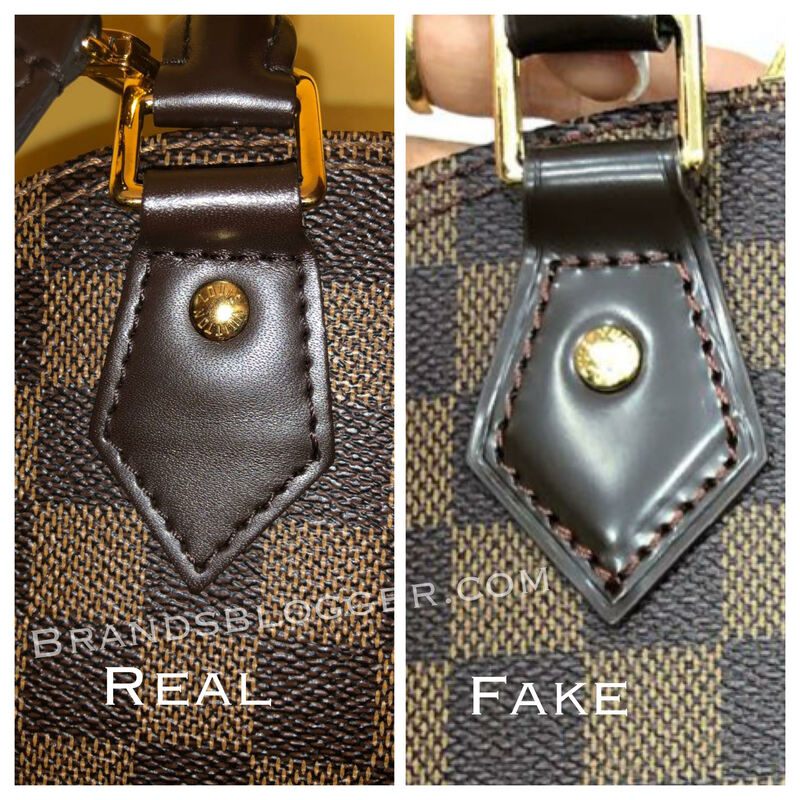 In the first picture, you can see the material of the leather in the real and the fake, the color and the shape. 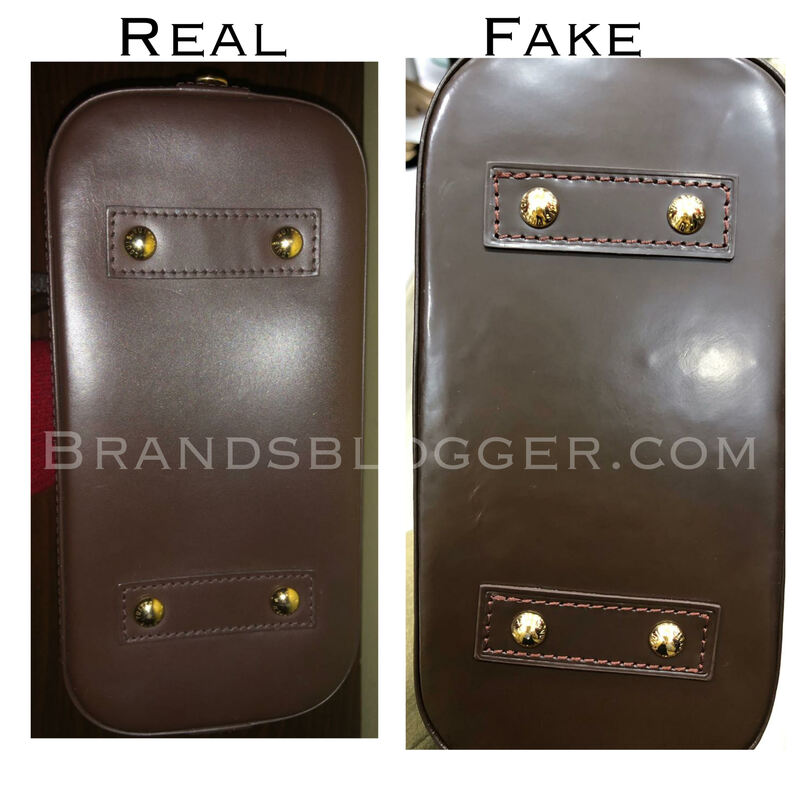 The authentic bag has a very beautiful brown color that in the first models were shiny so if it’s shiny don’t worry it has to do with the material and the launching date. 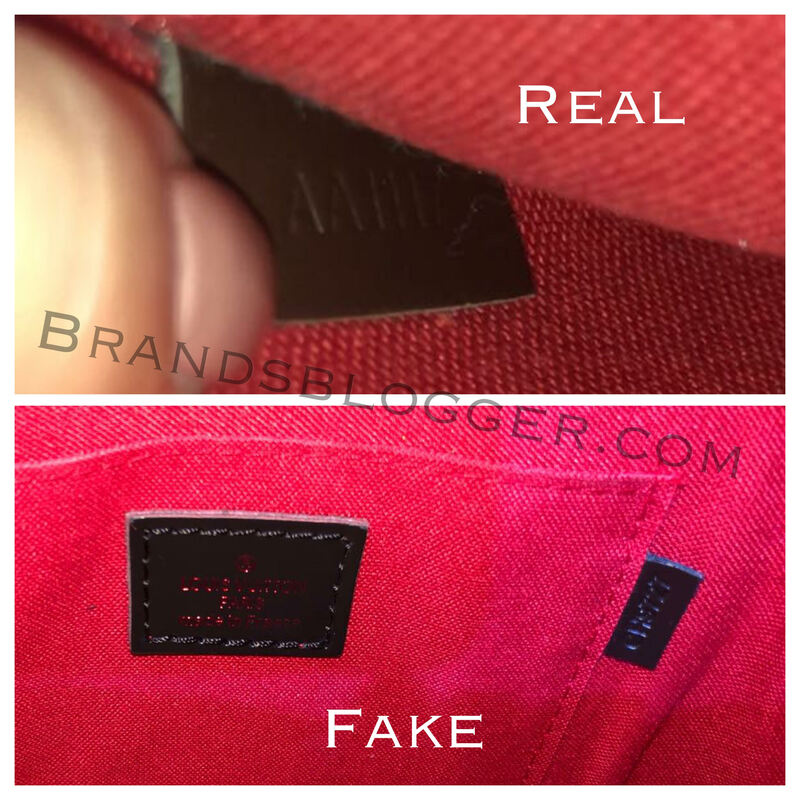 In the second picture you can see at the end of the bag, beside the stitches and the color the writing is completely on the other side of the authentic one, even the end of the zipper is terribly wrong. Let’s take a closer look. 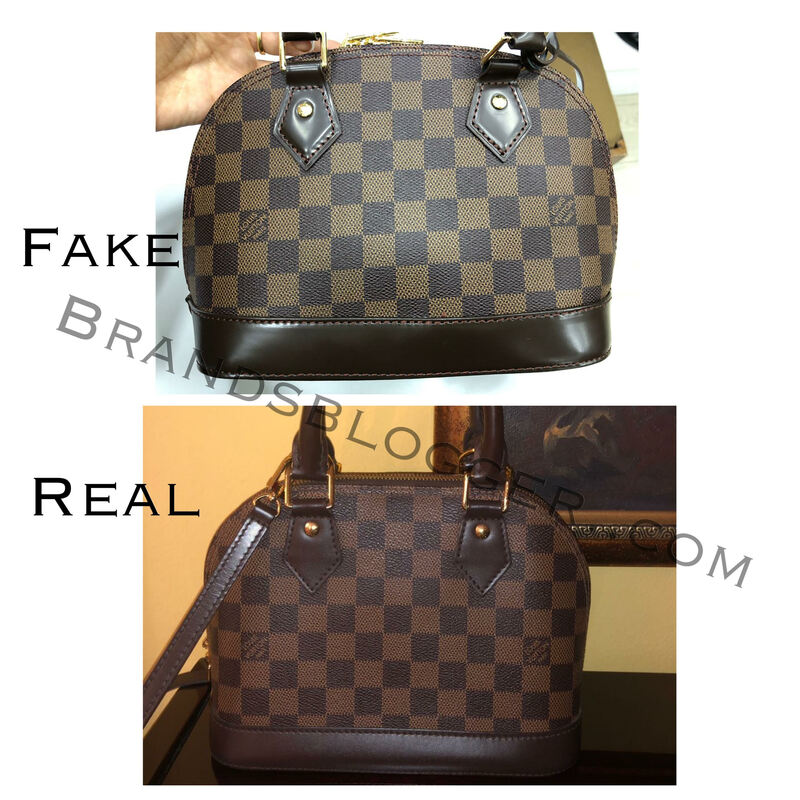 When you buy an LV product, you have to check the invoice because they always give you one. 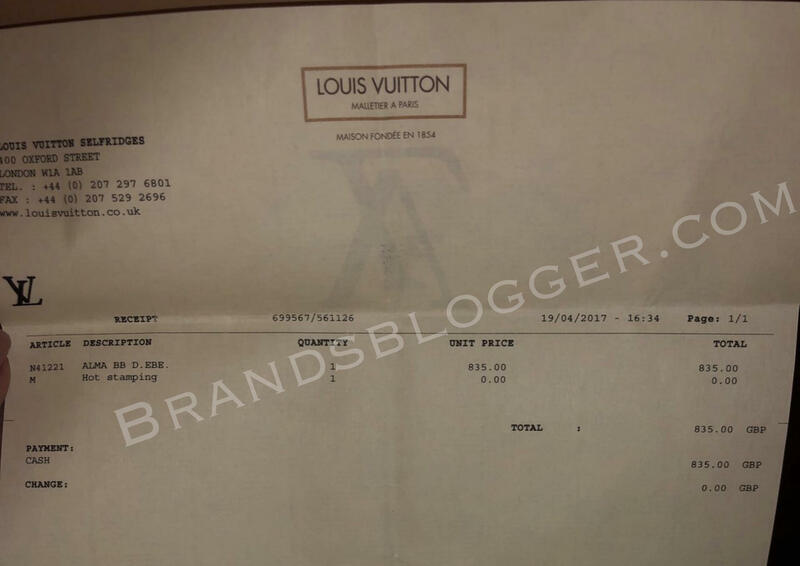 Here is an authentic invoice from Louis Vuitton shop. Ok, we have seen a lot of details till now, but let’s take a look at the shape of the bag, the differences between the colors and the size. What do you guys think? Was it this article helpful to you? If Yes please share this article and comment your opinion below. You can ask me for anything or any doubt you might have. Thank you.